The Panasonic Lumix DMC-ZS7 features a 25mm ultra wide-angle* 12x optical zoom f/3.3-4.9 Leica DC Vario-Elmar lens (35mm camera equivalent: 25-300mm) and delivers AVCHD Lite HD movie recording capability. Also, with the DMC-ZS7, it is possible to use the GPS (Global Positioning System) function to record data on the shooting location. You can view images for each geographical location by using the included software PHOTOfunSTUDIO 5.1 HD Edition to manage the images by date and location. AVCHD Lite identifies a subset of AVCHD format, in which HD-recording is limited to 720p. 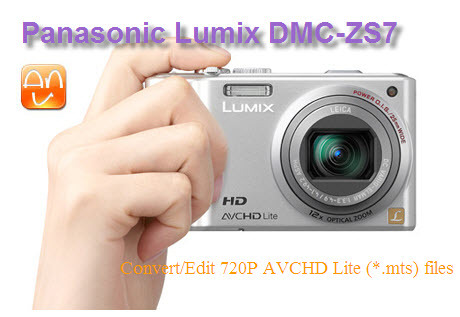 The name was used first in marketing literature for the Panasonic DMC-ZS7/DMC-ZS3/DMC-FT1/DMC-TZ7 digital cameras. Generally any video editing application with support for AVCHD should also support AVCHD Lite without your needing to do anything differently. PHOTOfunSTUDIO 5.1 HD Edition in Panasonic Lumix DMC-ZS7 (for Windows only) makes it possible to sort and organize photos not only of those newly taken but also of those stored in your PC. You can enjoy slideshows with a variety of effects and use your iTunes music library as background music and burn it onto a DVD disc in MPEG2. Motion pictures can be uploaded directly to YouTube using the built-in YouTube uploader even in HD (High Definition) quality. It also lets you create a 360-degree rotation panorama file in MOV, which is especially easy if Panorama Assist mode in the camera is used. The software is of course compatible with the Windows 7. Experience and feel the outstanding benefit of the PHOTOfunSTUDIO 5.1 HD Edition. It will powerfully allow you to view, edit and archive your captured photos and motion pictures with greater ease and fun. How to Resolve AVCHD Playback Problem on Canopus Edius 5?